Aperture was measured by focusing binoculars at infinity, then panning a laser into the ocular laterally to simulate a parallel beam. I put paper over the objective and measured the edge to edge illuminated boundaries. I achieved consistent results a little over 46mm. The Ascot uses plastic in its construction to reduce weight, and I couldn't help thinking they have a cheap feel to them. The Rubber creaked against the plastic as I gripped them. But they operated solidly mechanically. 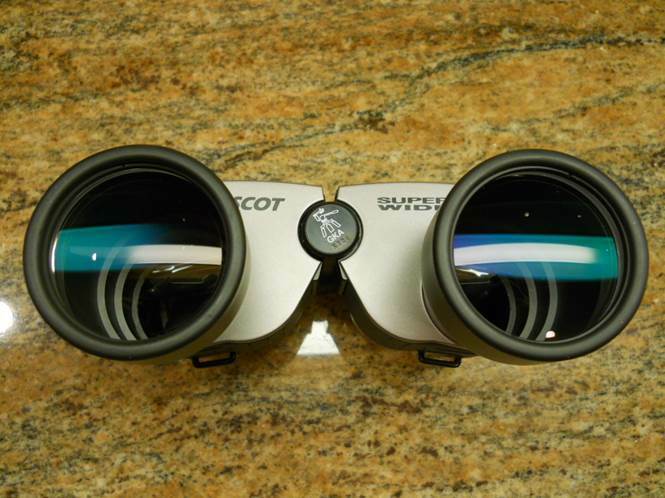 There is no bridge rocking as these binoculars have an internal focusing mechanism. I first tried these binoculars during daytime and found them unusable. The first pair had reasonably sharp center of view, but the top half of the field was much blurrier than the bottom. The second pair simply would not come to sharp focus center field. There was no “snap”, just hunting. The blurry perimeter of the extreme field of view of both was distracting. At night under a starry sky, they performed much better. It took about an hour to learn how to use these binoculars. I have a big nose which bumped the center focusing knob, but after some experimentation could avoid this. Although the eye relief is very short, that also can be managed while seeing the field of view without eyelashes wiping lenses. This design uses mirrors instead of prisms on the objective side, and as a result the focusing knob works backwards. I'm used to racking in clockwise to infinity, but these turn CCW. Like most wide field binoculars, lack of flat field benefits periphery sharpness by defocusing center sharpness a little past infinity. Binoculars I have for comparison are a Celestron Nova 10x50 8° FOV from 1989, and a Fujinon 10x50 FMT-SX 6.5° FOV from 2012, both Japanese. Although the narrowest, the Fujinon easily had the widest sharp FOV, the best ability to show faint stars, and brightest pinpoint stars. The wider Nova were excellent in central star sharpness. The Fujinon provided the most captivating view. I thought the Nova were wide, but they simply are not in the same league as the Ascot. The Ascot truly Spacewalks, as the sky fills my entire field of view. I could easily capture eta to lambda Sagittarius (bottom of handle to teapot dome) in one field. Although the wide FOV is thrilling, Ascot central image is quite soft. Central bright star images are large, and the “sweet spot” small. It's as if I'm not wearing my glasses. There are few faint delicate stars as most of them are unfocused. The view through the Nova is much sharper, and the area of sharpness much larger. Ascot contrast is good, and the ability the see the Dumbbell Nebula in suburban skies is equal to the Nova. M22 is very easy to spot with them from the city, and the Ascot works well finding objects as it has good contrast. When I looked briefly through the first Ascot at a dark site, I liked the wider view over the Nova, but didn't like the non-uniform sharpness. The second Ascot, I preferred my Nova because of general image softness. I currently own no Ascot, and view through my other wide field binoculars. Are the Vixen Ascot 10x50 the final answer to wide field astronomy? 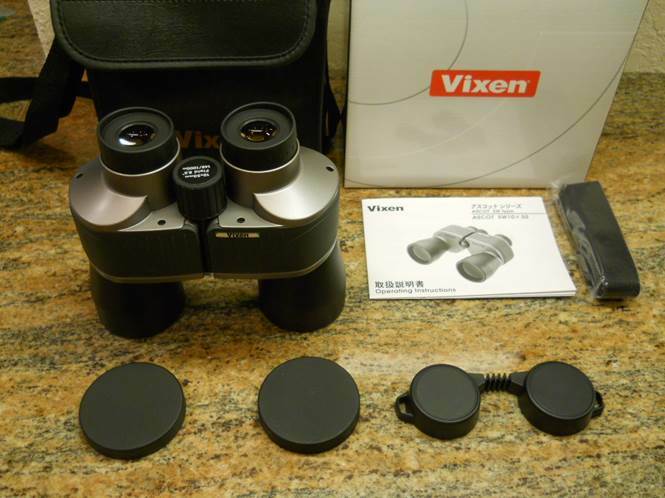 Although the wide field is thrilling, I am disappointed by Vixen's lack of quality control on the Chinese optics. One pair had a blurry upper half, and the second pair could not focus sharply. I would be reluctant to buy a pair without looking through them first. I am 18 months new to astronomy. 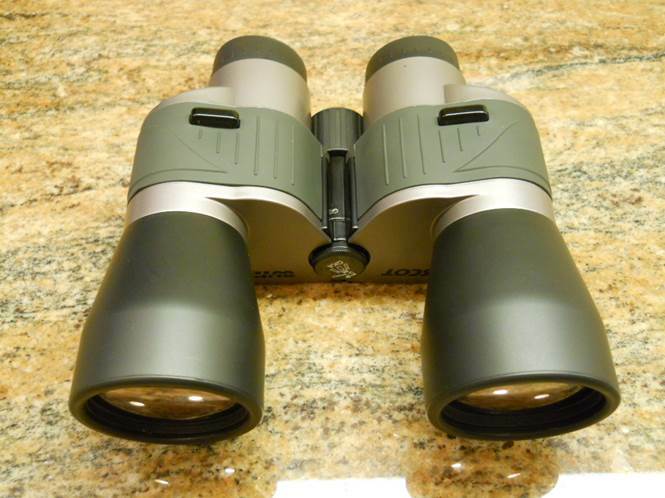 My first binoculars (BARSKA Gladiator Binocular w/ 10-30x Zoom (60mm objective lens)) were inexpensive ($50), and the only thing good I can say is they got me to buy something better. 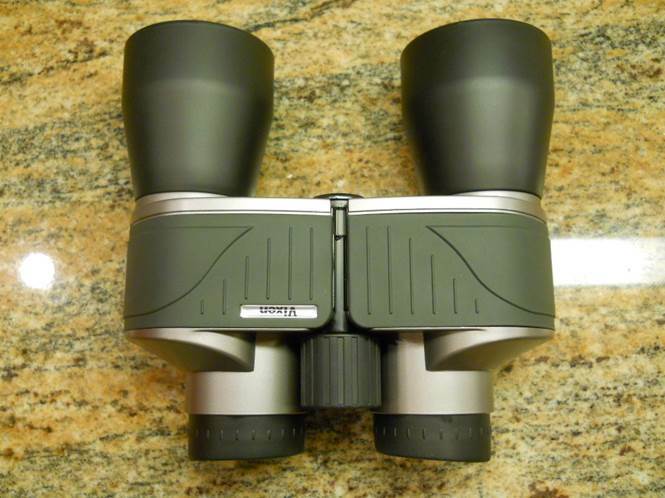 While I was buying a telescope, the seller showed me his Nikon 7245 Action Ex Extreme 10 X 50 mm All Terrain Binoculars. They were so much better than the ones I had, I went right out and bought one. I was very happy until about 4 months later I got a chance to see through a Vixen Ascot 10x50. Since I had spent close to $155, I was very reluctant to buy another pair that Amazon had for only $153, but that was the price then for the Vixen Ascot. The Nikon had 6.5 degree, where the Vixen had 8.5 degree. It doesn't sound like much but when you are learning how to sky hop, it is the difference between night and day. The Vixen makes it so easy to find things, I don't pick up the Nikons much any more. Yes the Nikon has more eye relief, and they are good quality. If I want to look at land objects, I pick up the Nikon before I pick up the Vixen. I also bought a few larger 80mm and 100mm aperture binos, but they are so heavy, I just find the Vixen so much more usable. I hope to learn how to travel around the sky, which I suspect will take me a year or two. Computerized telescopes help some, Dobs give great views, but binoculars are my main learning tools. I currently own 26 telescopes, 7 binoculars, 2 binoviewers, and I love them all. In another year I will start to thin the herd, but for now nothing goes away. I am learning how to do guiding, so I can enter astrophotography. But I always grab my Vixen Ascot. They are always inspiring. From that inspiration, I then roll out a big Dob, a SCT, or a refractor. They sky conditions inform me what might work best for that particular night. I do like the Vixen Ascots 10x50, but prefer the 9x63 and 15x63 Orion minigiants more; especially when all three are mounted on the garrett pistol grip monopod (with quick connects). Vixens are wider, but Orions are sharper. 9x63 is 7mm exit pupil. Those likely are 50* or less FOV. The 15x63 are about 52*. So you've got low power, high power, and wide fuzzy. Vixen claims a 8.5 degree FOV, an apparent field of view of 85 degrees and an eye relief of 7mm which must be a mistake and is likely the exit pupil. Vixen also claims they have both mirrors and BAK4 prisms. The Amazon price currently is $146. The huge FOV is nice for those learning the constellations and how to find things within those constellations. They do have very short eye relief and therefore are very prone to fogging. However as a first pair of 10x50s you could do a lot worse. Really nice FOV for a 10x50 ! Ten years ago I had an earlier version of this bino, it was amazingly sharp. Shame that the real aperture is only 46mm which means an additional 15% light loss. I have the same with the Vortex Vulture 10x'56' which turned out to be 10x52, so I treat them as '10x50' with some extra light transmission. I almost bought the Vixen New Forresta, yet its like you said very true, qc controll is a issue a lot when they shipped away a lot to China. Compared next to the Talons i saw way more of everything in detail and sharpness in the Talons, yet no distortions of any kind in the Talons 10x42. My 2.5 doublers come in a Japan and China version. Japan is numbered editions and the China is not. And China made 2.5 are totally junk. Look the same but glass is like day and night. Seems youre wide view search goes on. :-) good luck. I have the Vixen Forresta 7x50 and they are outstanding. Deep green coatings equal to the Nikon SE, excellent central sharpness, and pretty sharp to the edge. Daytime colors in them very vivid. Lightweight, with look and feel much like the Nikon 12x50 SE. Only complaint is 7.1* FOV like most 7x50s, but the image is so good I'll put up with it. I looked through two pair, the other another guy bought. Same good quality control. I think that's what you get from Vixen. 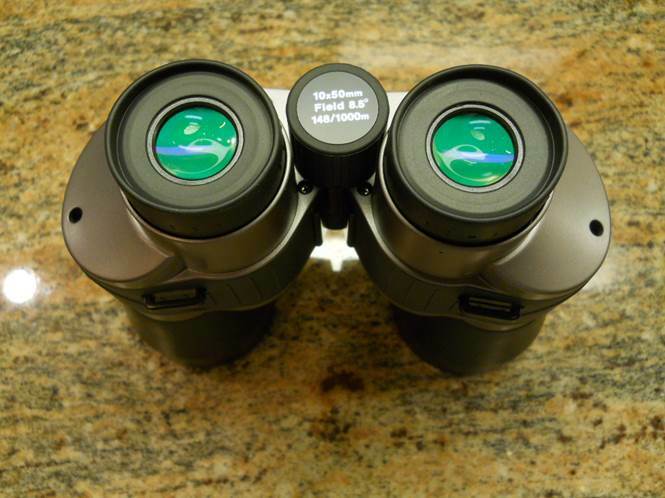 Comparing 7x to a 10x binoculars might not be apples to apples. Couldn't resist the temptation, so bit the bullet and bought my Ascot about 3 months ago. The lack of eye relief means they are slightly less pleasant to look thru, but the wide view is worth the discomfort. You can see entire asterisms, and small constellations. Plenty of coma around the edges, a minor distraction. Mine do focus sharply, and the brightness compares well with my other 10 X 50s, all of which are in the 150-200 price range. I prefer my Nikon 12 X 50 AE, but am more likely to find objects with the Ascot, thanks to its large field. For the price - around 160 - I am happy with it, and plan to keep it. If you could only buy a few binoculars you would do well with the Ascot and the Nikon AE. You were fortunate to get a good pair.